The people in the cars crawling up and down Manchaca Road at just past 6 p.m. on a recent Tuesday had no idea that just 30 yards away, Old Austin was jamming with New Austin inside a packed music venue. To evening commuters, Crockett Center is just a dingy row of storefronts between Ben White Boulevard and Stassney Lane that means they’re one eyesore closer to home. But to an Austin music scene that sometimes gets bored with itself, the strip mall’s 24-hour coffee shop is a much-needed jolt. 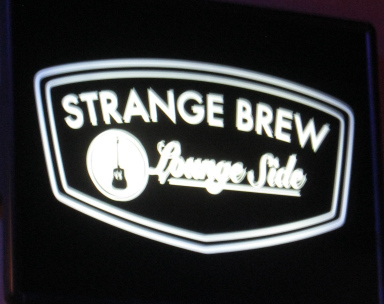 Strange Brew, with its 150-capacity Lounge Side, a separate room with pristine acoustics, is fast becoming Austin’s clubhouse for singer-songwriters of all styles, from folk to rock. There’s a whole underground scene going on, feeding the live music desires of older fans who live in the neighborhood or just don’t want to deal with the hassles of downtown. When Patty Griffin decided to do a secret warm-up show on the eve of her current national tour, she picked Strange Brew after her sound man checked it out and determined all the raves he’d been hearing about the acoustics were on the mark. Scott Ward owns the joint. Photo by Shelli Fontenot. Owner Ward, who ran four independent insurance offices before opening Strange Brew in June 2010 as a coffee shop only, oversees all the operations at the 4,200-square-foot music venue/café/study hall/beer garden hybrid that seems extracted from the corner of Sixth and Guadalupe streets circa 1979. It brings a coffee smell to the spirit of the late Alamo Hotel, with its folk singer lounge and all the nondescript shops and offices down the hall. Strange Brew serves nightly musical magic nestled in between a kung fu studio and a cigarette shop. 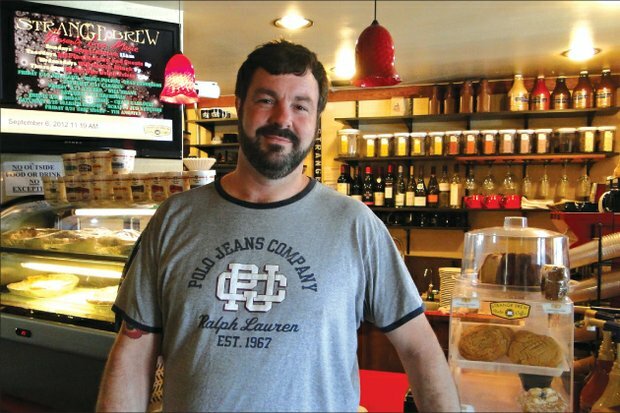 Ward had the idea to open a 24-hour coffee shop when he and a friend made plans to meet for coffee late one night and couldn’t find anyplace in South Austin. He tried to raise money on Facebook, but when that plan yielded only $400, he went looking for investors and found one. Ward said it took about $86,000 to open and expand Strange Brew. The plan all along was to host live music, but the space was too small for anything but solo acoustic performers. But when the tattoo shop next door closed in the summer of 2012, Strange Brew moved into that space, which now serves as the listening room. On a recent Tuesday, singer Malford Milligan and guitarists Plankenhorn and Michael O’Connor led the Apostles of Manchaca on a soulful rock set with extended guitar solos that wouldn’t have been out of place at Steamboat or the Black Cat Lounge in the ’90s. But those clubs are no longer around and Sixth Street has become overrun with youthful partiers who’d rather check each other out in the barricaded streets than go inside and pay a cover to hear bands. A growing number of music fans are getting their weekly fix at venues away from the entertainment district, such as the One2One Bar on South Lamar Boulevard, the Skylark Lounge on Airport Boulevard near Manor Road, the Moontower Saloon on far south Manchaca and Sahara Lounge on Webberville Road. (See sidebar.) Some would also say that the reformatted Scoot Inn (Fourth and Navasota streets) fits in with these clubs because it’s also a destination, albeit one in walking distance from the new East East Sixth Street hotspot. “We were downtown for eight and a half years and we were doing fine,” said One2One owner Gregg Ware. “But our bands couldn’t park, our customers couldn’t park. Our rent is actually higher on South Lamar, but we have access to 125 parking spaces.” Strange Brew has 90, with overflow parking in the neighborhood. Oh, yeah, neighbors. One of Ward’s main concerns when he started hosting live music was that nearby residents might complain about the noise. It only takes one to ruin a good thing. “Even before we opened the big room, I was approached by a hard-core punk record label that wanted to rent the room for 10-12 bands to play during South by Southwest,” Ward said. “I mean, it was so loud your ears would bleed. About five of the bands had two drummers.” The next day, a neighbor approached Ward. Uh-oh. “We’re glad to have you,” he said, “but we’re a little concerned about possible noise.” Asked if he had heard the music from the day before, the neighbor said he hadn’t. “That’s when I knew we’d be fine.” Ward said Strange Brew has never had a noise complaint. Indeed, the Lounge Side contains its sound so well that you can barely hear full bands while sipping coffee and eating paninis next door. 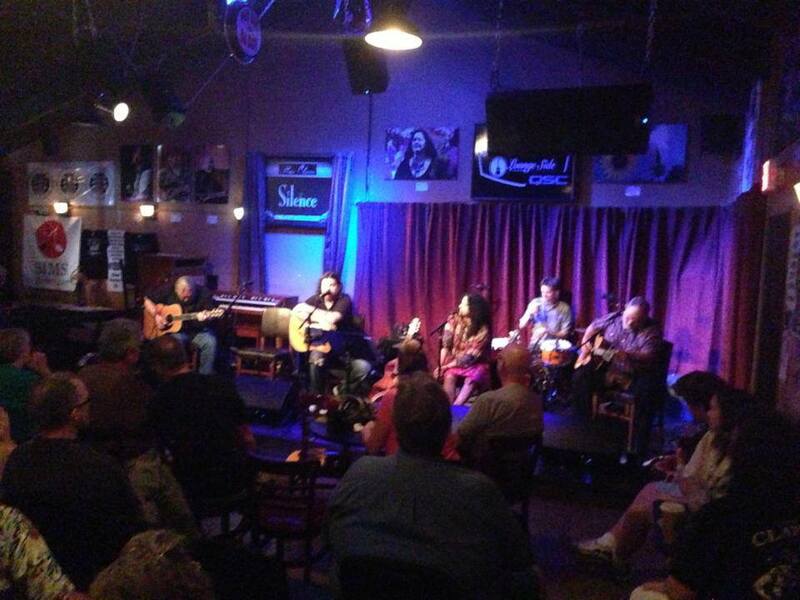 There are several coffee shops in town that regularly host live music, such as Flipnotics on Barton Springs Road. But what sets Strange Brew apart is a listening room experience rivaled locally only by the Cactus Café, which Strange Brew toppled as best acoustic venue in the most recent Austin Music Awards. The Brew is one of the only venues in town to have an endorsement deal with its sound equipment supplier, QSC. But it’s not just the quality sound that makes Strange Brew such a vibrant addition to the Austin music scene. It’s the community vibe. After drummer Tiny Watkins died from a heart attack last month, the Brew took up a collection to help pay funeral expenses, even though Watkins had never played the venue. Austin musicians haven’t had a hangout spot like this since Momo’s closed two years ago. On a recent visit, Brew regular Ernie Durawa of Texas Tornados was at a table on the coffee side telling Doug Sahm stories to a scruffy trio of young musicians while Erik Larson and Peacemaker were covering current Austin band Reckless Kelly. Coming this weekend to the venue, built in 1969 to house the U Sav Drug Mart, are Will Taylor and Strings Attached hugging Led Zeppelin Friday (10 p.m.), Joe “King” Carrasco, Charlie Faye and Jess Klein on Saturday, and the ever-popular gospel brunch at 11 a.m. Sunday. That the venue’s marquee is at the bottom of a strip mall sign touting a nail salon, insurance office, chiropractor, tobacco store and the like, is indicative of the overall mindset. Strange Brew wants you to find it on your own. That’s the organic way. The highlight of the week is almost always the Sunday gospel brunch (11 a.m.- 1 p.m.) featuring the Purgatory Players, a revolving cast usually anchored by guitarists Plankenhorn and Jon Dee Graham, when they’re not out on the road with Joe Ely or True Believers. Seela Misra is also usually there, with guest appearances from Ruthie Foster, Milligan, David Grissom and the like. The material is more spiritual than religious and the onstage banter is as far from preaching as you can get on the Lord’s Day. The traffic on Manchaca Road was heavy for a Sunday morning. No idea that just out the window and behind that door, something special was going on. Sahara Lounge. 1413 Webberville Road, 512-927-0700. There was a big outcry in July 2011 when vintage juke joint TC’s Lounge was replaced by this more upscale lounge, but Sahara quickly established itself with exceptional live music in a variety of styles, from Latin jazz, funk and African bands to Wednesday night’s country music lineups. Co-owners Ibrahim Aminou and Eileen Bristol play in Zoumountchi, which is also one of Robert Plant’s favorite Austin bands. One2One. 1509 S. Lamar Blvd. Suite 600. 512 473-0121. The original location opened downtown at Fifth and Brazos streets in 2004, but this rock and soul club relocated to a strip mall in the former site of Slick Willie’s pool hall in October 2012. High-energy shows by Mingo Fishtrap and DaHeBeGeeBees established the storefront between Darque Tan and Domino’s as a rock/funk powerhouse, but acoustic shows by Charlie and Will Sexton and others also work well in the black box setting. Moontower Saloon. 10212 Manchaca Road. 512-712-5661. Party at the Moontower, a 700-capacity venue that opened south of Slaughter Lane in November. Owners Josh Bumb and Richard Veregge spent two years converting an old house into the main bar, but the music happens outdoors, Thursday through Sunday til 9 p.m. and weekends til 11 p.m.
Skylark Lounge. 2039 Airport Blvd. 512-730-0759. From the outside, this venue within a complex of auto body repair shops looks like they have a junkyard dog for security. But inside is a basement jazz club vibe. Parisian Haily Tuck is a fitting highlight of this tucked-away venue. This entry was posted on August 8, 2013 at 7:58 pm	and is filed under Uncategorized. You can follow any responses to this entry through the RSS 2.0 feed. You can leave a response, or trackback from your own site.